Richard Irwin (Belper, United Kingdom) on 25 March 2008 in Plant & Nature. I like the way winters empty spaces are being filled by new colour each day. It is easy now, I have just a few choices at what I photograph, but soon spring will be overwhelming..
Day after day you are giving us such wonderful flowers. It's delightful. As with the others, the DOF is superbly handled so that we get a "wash" of background color that anchors the piece. It`s really a beauty of spring!Love it!Background color goes well with the foreground. I love Camilia's. Beautifully photographed Richard, so pretty and delicate. Your flower-shots are just perfect- even the previous! another wonderful shot - I love how the background colors match the flowers. Well done! These flowers are incredibly beautiful! This is a wonderful shot. I love the pink, it's so cheerful compared to our brown and grey. I wish I had even your small choice.. This is absolutely perfect, Richard! Beautiful and this shot is well composed with great DoF too! superbly composed. The colors are so very cool. I find this image to be really pretty. I just want to pluck one of those flowers from the computer! 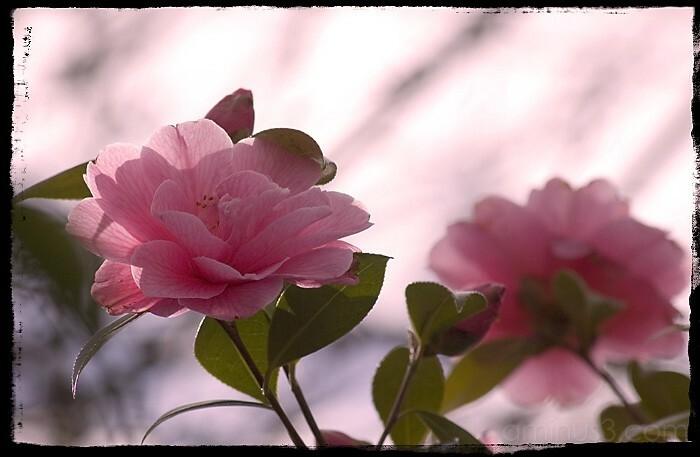 I see camellias are blooming over the oceans, too, at this time of the year! Here they are at its best now.....Actually, I'd like to have a camera in one of my eyes to be able to shoot everywhere at any time without the encumbrance of carrying the object! Which I cannot do all the time!Lovely light and enchanting colours!